Have storm photos? Submit them here. • Route 42 between Millville Road in Hemlock Township and Black Run Road in Madison Township. • (New) Route 1019 (Kachinka Hollow Road/Freas Avenue/Cemetery Road) between Evansville Road/Martzville Road) in Briar Creek Township and Freas Avenue in Berwick. • (New) Route 2003 (Old Reading Road/Kulp Road) between Pine Swamp Road and Duke Road in Roaring Creek Township. • (New) Route 3001 (Tyson School Road/Fisherdale Road) between Bear Gap Road and Jefferson Road in Cleveland Township. • (New) Route 3008 (Bear Gap Road) between Fisherdale Road and White Church Road in Cleveland Township. • Route 3012 (Mt. Zion Road) between Southern Drive in Catawissa and Orchard Drive in Franklin Township. • Route 4008 (Back Branch Road) between Millerton Road and White Church Road in Mount Pleasant Township due to downed tree. • Route 4009 (Millville Road) between Millertown Road in Mt. Pleasant Township and JTM Enterprises/International Housewares Inc. in the Town of Bloomsburg. • Route 4041 (Rohrsburg Road) between Route 487 and Sportsman Club Road in Orange Township. • Route 4034 (Mt. Pleasant Road)/Charmund Road) between Boro Alley and Route 487 in Orangeville Borough. • Route 4049 (Central Road/Elk Grove Road) between Route 118 in Sugarloaf Township and the Sullivan County line. • Route 54 between Route 254 in Derry Township and Valley Road in Valley Township. • Route 54 between Preserve Road and Strick Road in Anthony Township. • Route 1004 (Arrowhead Road) between Route 54 and PPL Road in Anthony Township. • Route 3003 (Narehood Road) between Steckermill Road and Mexico Road in Liberty Township. • Route 3004 (Pottsgrove Road/Mooresburg Road) between Liberty Valley Road and Route 45 in Liberty Township. • Route 3010 (Steckermill Road) between Route 54 in Derry Township and Narehood Road in Liberty Township. • (New) Route 147 between Ferry Road in Jackson Township and Upper Road in Herndon due to a downed wire. • Route 405 between Route 147 and Housels Run Road in West Chillisquaque Township. • (New) Route 405 (beginning of Route 405) to Route 45 in West Chillisquaque Township. • Route 1025 (Shakespeare Road) between Route 45 and Hobbes Road in East Chillisquaque Township. • Route 1027 (South Mill Road/North Mill Road) between Route 642 and Shakespeare Road in East Chillisquaque Township. • Route 1029 (Mexico Road/Creek Road/Follmer Road) between Route 642 and the Montour County line in East Chillisquaque Township. • Route 3001 (Otto Station Road) between Muth Hill Road and Grively Road in Jackson Township. • Route 3024 (Mahantango Creek Road) between Adams Road and Route 225 in Lower Mahanoy Township. • Route 4004 (Mile Post Road) between Shikellamy Avenue and Mt. Pleasant Road in Upper Augusta Township. • Route 4004 (Mile Post Road) between Snydertown Road in Rush Township and Sunbury Road in Riverside Borough. Bloomsburg Police are repeating the request they made earlier in the day for residents of Bloomsburg who live west of Railroad Street to be ready to evacuate with 72 hours' supplies at a moment's notice as Fishing Creek is near overflowing its banks. But now they're adding the additional warning that storms passing through overnight could increase the chances of flooding in residential areas. "We ask that residents consider leaving before dark to reduce the possibility of having to evacuate in the middle of the night," said Police Chief Roger Van Loan. He said there is not a mandatory evacuation at this time. But he asked that all residents in the area have personal items ready to go and move valuables to a second story if possible. Van Loan also asked that those residents who are able check on their elderly and disabled neighbors. The rain is falling again, and high creeks have closed the Iron Bridge at Millville Road and sections of Fort McClure Boulevard. 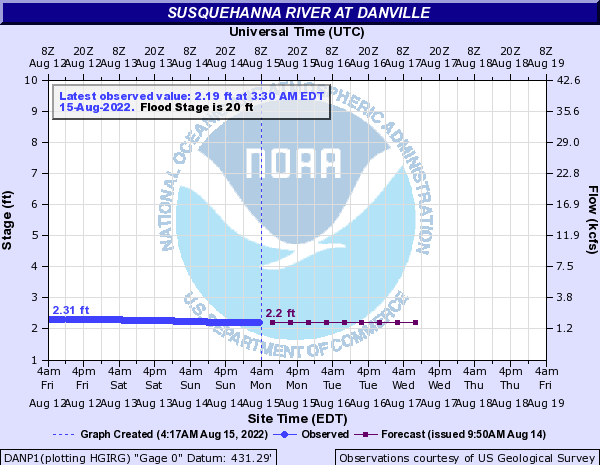 But the forecast for the Susquehanna River's crest on Friday morning has fallen. As of 5 p.m., the National Weather Service was predicting that the Susquehanna River would crest at 19.4 feet, which is just into the minor flood stage for the town. 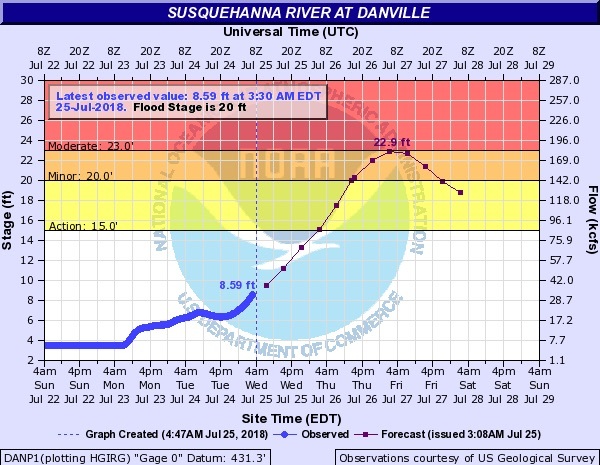 At Danville, the river crest was expected to crest at 20.5 feet, also in the minor flooding category. The following message has been released by the Columbia County Emergency Management Agency. At 2 p.m. the EMA had a conference call with the National Weather Service for updated information. At this time the National Weather Service said we could receive an additional 1 to 1.5 inches of rain. There may be some storms that produce locally heavy rain which could drop 1 to 2 inches per hour. The bulk of the rain will be in the next 12 hours. The crest of the river expected to be Friday afternoon. Motorists should not attempt to drive through flooded areas. Be advised six inches of rapidly flowing water can knock an adult to the ground and eighteen inches can wash away a vehicle. Stay tuned for weather updates, announcements and additional information as it becomes available. Please listen to your local TV or radio stations, you can also go to http://twitter.com/ColumbiaCoEMA for information. • Route 487 between Bethel Road and Orchard Drive in Franklin Township. • Back Branch Road between Millertown Road and White Church Road in Mount Pleasant Township due to downed tree. • Rohrsburg Road between Route 487 and Sportsman Club Road in Orange Township. • Central Road/Elk Grove Road between Route 118 in Sugarloaf Township and the Sullivan County line. • PPL Road/Muncy Exchange Road between Strawberry Ridge Road in Derry Township and Arrowhead Road in Anthony Township. • Arrowhead Road between Route 54 and PPL Road in Anthony Township. • Narehood Road between Steckermill Road and Mexico Road in Liberty Township. • Pottsgrove Road/Mooresburg Road between Liberty Valley Road and Route 45 in Liberty Township. • Steckermill Road between Route 54 in Derry Township and Narehood Road in Liberty Township. • Route 61 between Route 487 and Main Street in Shamokin Township. • Route 61 between Irish Valley Road and Route 487 (Valley Avenue) in Shamokin Township. • Route 405 from Route 147 to Housels Run Road in West Chillisquaque Township. • Shakespeare Road between Route 45 and Hobbes Road in East Chillisquaque Township. • Mexico Road/Creek Road/Follmer Road between Route 642 and the Montour County line in East Chillisquaque Township. • Mile Post Road between Snydertown Road in Rush Township and Sunbury Road in Riverside Borough. The Elysburg amusement park posted this video to its Facebook page earlier today, with the caption, "This one’s going to take some clean-up. We’re closed today, folks." Roads closed as of 10 a.m.
From PennDOT: Here are a list of roads closed due to flooding or trees down, as of 10 a.m.
• Route 11 between Northumberland Borough and Danville Borough in Montour County due to a soil slide. • Route 54 between Mill Street in Riverside Borough to Logan Run Road/Boyd Station Road in Rush Township. The Bloomsburg Police Department wants all west end residents in Bloomsburg ready to evacuate. In a press release issued this morning, Police Chief Roger Van Loan warned that Fishing Creek, which runs along the town's western edge can be unpredictable under the heavy rain conditions the region has seen over the past few days. Van Loan asked that all residents west of Railroad Street should prepare to evacuate on short notice, with enough clothing and supplies for up to 72 hours away from home. Police suggested moving any valuables to a second story out of the way of floodwater. And police also suggested residents consider leaving now to reduce the possibility of being caught unaware. If flooding becomes imminent, the Bloomsburg Police Department will sound the flood warning system, the release said. If residents hear that siren, it means it's time to evacuate immediately. In the past, flooding of Fishing Creek has occurred rapidly and there is little time evacuate, the police warn. Volunteers plucked people from the rising water of Roaring Creek in two separate rescues before 8 a.m. today after the creek trapped them at homes and campgrounds. At 581 Numidia Drive, rescuers pulled a family of five from floodwaters. And at Shady Meadows Campground, an elderly couple trying to escape the rising water had driven off the road and were trapped with water seeping into their truck. From PENNDOT: Motorists in Northumberland and Montour counties are advised a rock slide has closed Route 11 between the Northumberland Borough and Danville Borough. Detours are in effect. Please note the Northumberland to Danville detour has been changed since the initial advisory due to flooding that has closed Route 11 between the river bridge at Northumberland Borough and Route 15 at Tedd’s Landing. Motorists traveling from Northumberland to Danville should use Route 147 south to Sunbury and Route 61 north to Route 15 north to Interstate 80 east to Route 54 east. Motorists traveling from Danville to Northumberland should use Route 54 west to I-80 west to Route 15 south to Route 61 south to Sunbury and Route 147 north. Roads are closed across Columbia County due to creek flooding, mud slides and trees down. Here's a list of road closures or partial blockages of around 6 a.m. reported to the Columbia County EMA Center. Crews were out working to clear road blockages, so some of the above incidents may already have been cleared. Crews were also attempting to help people surrounded by floodwaters in a house on Numidia Drive, EMA officials said. 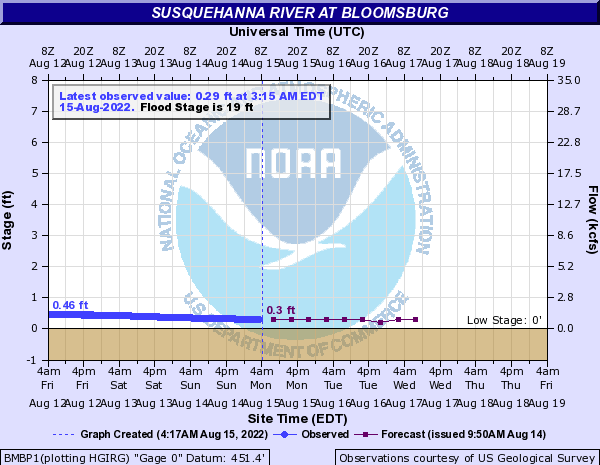 The National Weather Service flood forecast at Bloomsburg and Danville for the Susquehanna River's crest jumped up overnight, inching closer to what the NWS considers "moderate flooding." 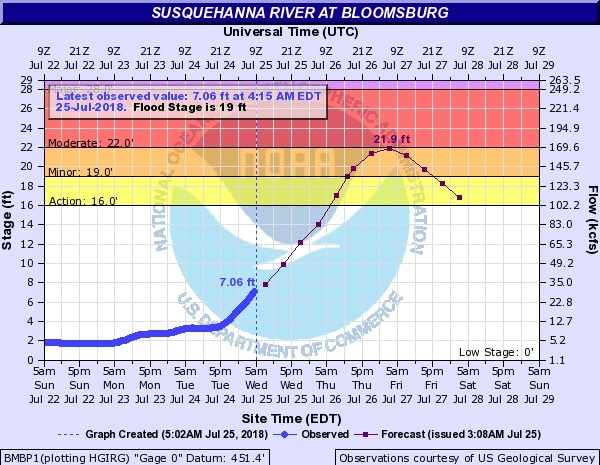 In Bloomsburg, meteorologists are now predicting that the Susquehanna River will crest at 21.9 feet at 6 p.m. Thursday, just below the area's moderate flood stage of 22 feet. At 22 feet, some houses along Fort McClure Boulevard and others between the Bloomsburg Fairgrounds and the river take on water, according to the NWS. Click here to see the graph. • 20 feet: Inundation begins in Riverside. • 21 feet: Basements flood in homes along Mahoning Creek in the Danville area. • 23 feet: Flooding occurs at the state hospital grounds on Danville's east side. Backwater can produce flooding on Sechler Run in the center of town. Borough officials have said they plan to keep a pumping station on Sechler Run manned around the clock to keep Sechler Run under control. Click here to see Danville's flood forecast graph. Check back here throughout the day for more updates. For all breaking news alerts and updates, follow us on Twitter.